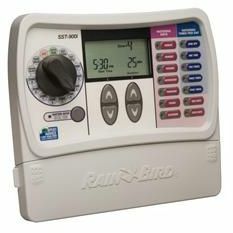 Add more value, versatility and convenience to your automatic underground watering system with a Rain Bird SST Series Automatic Sprinkler Timer. Customize watering shecules tailored to your unique landscape needs, while dramatically conserving water and improving lawn and plant health. The Simple To Set Sprinkler Timer offers maximum versatility and efficient watering with water-conscious features like Automatic Rain Shut-off to stop operation during rain. It can even be easily linked to existing drip watering systems. Zone by zone setting convenience.